A place to find Dee's Articles, Information and Opinion. Research shows that Children who comprehend patterns in the world around them develop skills to acquire and retain information. Many of Dee's workshops show teachers how patterns have the potential to make a major contribution to inspire teachers and increase their variability of teaching strategies. Many people in modern society have never considered the possibility of hunting for their own food. However, with the negative environmental and welfare implications associated with the agricultural industry and with the current high cost of meat, it is becoming more of a viable option. There is no waste in nature and all the waste products of living things are used as raw materials by others. In natural ecosystems, soil organisms break down organic matter making nutrients accessible to plants. It is nature's digestive system in action. Organic gardeners recycle crop residues and animal wastes and are surrounded by organi matter free for the gathering – manures, seaweed, grass clippings, nettles, comfrey and urine. Margaret Jones is 90 years old and is proud of the fact that nobody is subsidising her health! She may be old but she is living proof that old doesn't mean you lose your faculties. There is no pillbox sitting on her bedside table. "If you believe in organics you can't believe in pharmaceuticals," she says. The death in February 2010 of Ms Natasha Harris of Invercargill, just 30 years of age, made headlines when her partner told the news media that she died as a result of her addiction to drinking coke. The Guardian headline 'Coca-Cola habit linked to New Zealander's death', was just one example of the worldwide coverage. Congratulations, you are about to join the growing revolution of people who are digging up their lawns, sheet mulching, installing raised garden beds, and filling containers with edible plants. Over the centuries the very same planting, growing and harvesting skills you will be learning have been the basis of life..
Sally Fallon was on a recent speaking tour in NZ hosted by the Weston A Price Foundation. 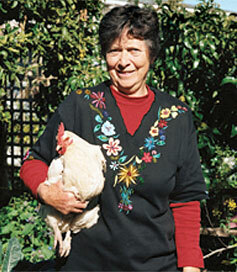 Dee interviewed Sally in the May/June issue of OrganicNZ. Check out Sally's Work on The Weston A Price Foundation. A timely warning to everyone. Email from Teacher at Milford Kindergarten, after Dee's visit. What's Happening in My Garden. All over the world people are searching for better ways of growing food and sustaining life. Sheet Mulching at Murray's Bay Intermediate School. 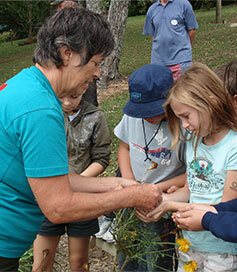 Seeds - Learning from Nature is a Lifelong Education. Our 4 year old children used the information they "read" to learn about wasp nests. They then made their own nest using the shape and 'stamped' the interlocking shapes. They then cut around their nest and displayed their work on the wall. 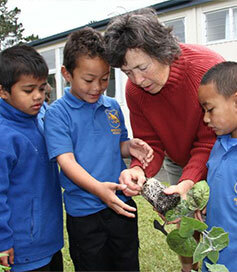 This all fits with the Early childhood Curriculum Te Whariki Communication & Exploration Goal. Finding information and using it to build their knowledge and understanding of the natural world. It was a beautiful sunny afternoon and while examining a swan plant that had reached 2 metres, tiny flashes of red caught my eye. On closer examination I saw the tightly clustered swan plant seeds were crawling with tiny red insects that I had never seen before. Photographs being the best method of identification, Mike was quickly on hand to photograph the evidence. 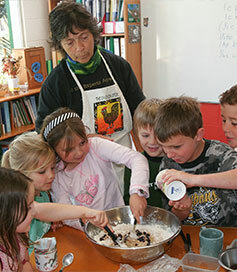 After capturing the insects and placing them in a large jar, complete with foliage and seeds, I rang Landcare Research. An email complete with photographs was sent to Leonie Clunie. "These insects are the immature stage of Arocatus rusticus, an Australian bug. Common name is swan plant seed bug, as that is where it's usually found. Also found on a NZ plant Parsonsia and Tweedia. Hibernates under bark and under old leaves of cabbage trees. These nymphs don't have fully developed wings yet. In adults, grey wings cover the red body and you only see a red flash as they launch into flight." I will be watching with interest to see if we can photograph the adults when they develop. But if any of you have seen this insect and would like to share some of your photos, just send me an email. With my expertise in cooking and growing food organically and Mike's ability to repair and fix things we were the perfect couple to manage Tauono's Organic garden Cafe between 2001-2008 on Aitutaki, the quintessential tropical island. Experimenting with new recipes, gathering food from the plantations, tending the cafe garden and cooking with island food was an absolute delight. Visitors loved the abundant tropical produce and the unique island-based cuisine which offered healthier alternatives to the highly refined and imported processed food. I knew that Aitutaki and Sonja's cuisine needed to be shared with people unable to sit in the garden and savour the food, the flavours, the colours and the warm tropical air. So I teamed up with Sonja to bring these delicious island flavours to your kitchen. Now, let Sonja's Kitchen inspire you to create many delectable dishes that visitors have enjoyed at Tauono's Organic Garden Cafe on Aitutaki. The Storylines Festival of New Zealand Children's Writers and Illustrators has been a highlight of many families' calendars since 1993. The festival – particularly the Free Family Days around the country – give children (and adults!) a chance to meet their literary heroes - authors, illustrators, storytellers or book characters. While visiting Dee at Factopia, and using the masks many children discovered some of nature's clever technology and experienced the world of insect eyes.. 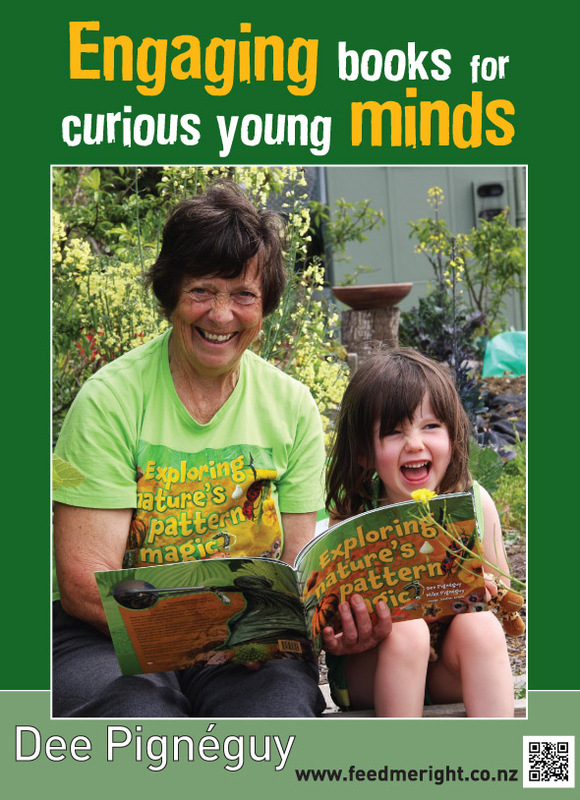 If you would like Dee to bring her insect heads to your school to show you just how insects see please contact her. We prune to prevent disease, damage and manage size. • You want a 'pickable' height for your section. This may be dwarf root stock. • Prune for mowing and for air movement in and around the tree. Kia ora koutou, Many of you will have met Stephanie Bowman when she was in New Zealand and helped make the wonderful eel tapestry. Velvet is now on the move check out her blog to see when will it be coming to your location. What are the new challenges for gardeners with changing weather patterns? Dee spoke at the Snells Beach Garden Circle, Mahurangi East Community Centre, Snells Beach. October 2017. Dees series of workshops for Garden to Table have featured identifying herbs and unusual plants to establish biologically diverse plantings for beneficial insect gardens, pruning and the importance of patterns. Lagoon Day Rarotonga - October 2015. Dee was a guest speaker on the local radio Rarotonga. Both Dee and Mike were involved in helping to judge this amazing Cook Islands Science fair. While in Melbourne recently, Dee visited the Croydon West Primary School. 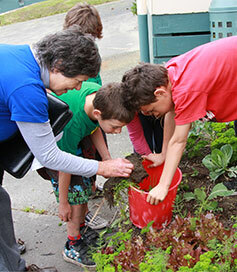 Ruth Bode, the Sustainable Future's Teacher and her pupils showed Dee around their amazing school garden. © Dee Pignegy 2009 - 2018. All Rights Reserved.